I thought I would change things up and show men's fashion. I am my husband's stylist. In picking out his clothes, I try to keep him looking hip, yet age appropriate. When he mentioned this weekend, that he thought he needed some boots, I decided to pick out "chukka" boots and style an outfit around them. 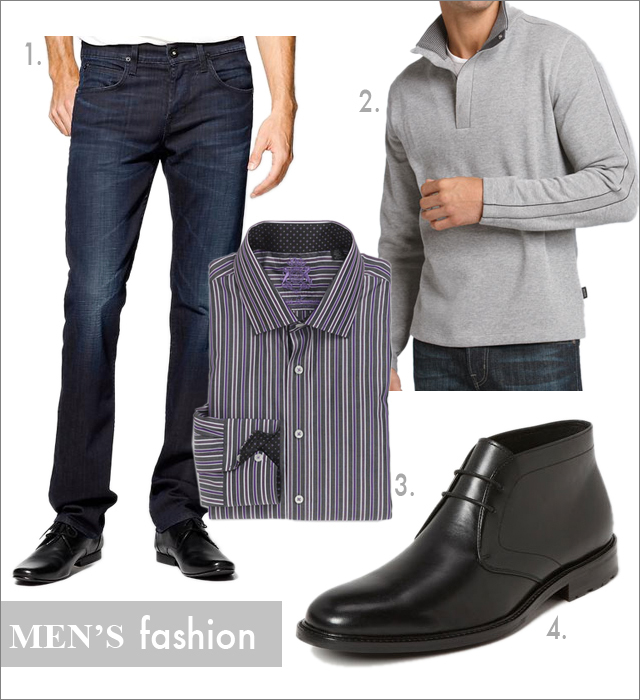 What I picked was a casual Friday look with darker, trim denim, 1/4 zip/button pullover, and button down shirt. For non casual days, you could easily switch out the denim and chukka boots for dress pants (not khakis, though) and loafers. I know somebody that would look really good in those clothes!